The Cinderhill build has now gone from 300 houses to 3,000! there are 4 meetings that you can attend to see the damage! 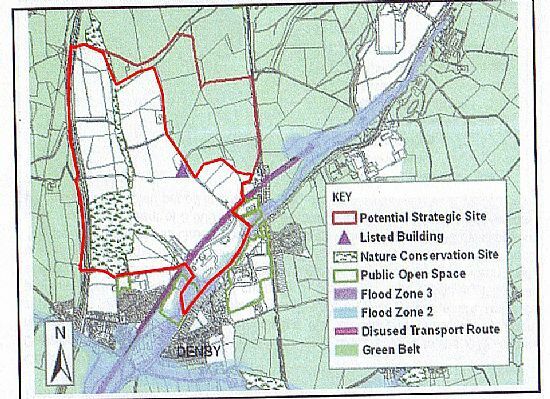 The prospect of a major development in the form of a new local settlement at Denby is to be the subject of a public consultation by Amber Valley Borough Council. This follows an approach from prospective developers, the Commercial Estates Group (CEG), who have put forward initial suggestions for a development of between 1,000 and 3,000 new homes, together with new employment uses, education facilities, health services and improvements to transport infrastructure. Crucially, the proposals could finally offer a long-term solution to the pockets of dereliction and contamination in the area. CEG, together with the Banks Group, have previously submitted plans for up to 300 homes and 30 hectares of employment land at Cinderhill, but changing economic conditions now mean that these plans are unlikely to come to fruition in the form and scale previously proposed. The concept of the local settlement is still at an early stage, and the Borough Council is urging people from Denby and Kilburn, as well as Belper, Ripley and other surrounding communities, to attend a series of public exhibitions later this month to ask questions and to see the initial ideas. A new local settlement is 'a self contained, self sustaining settlement that would be of a scale that could largely accommodate its own services, employment, education facilities and other infrastructure. A development on this scale could reduce the pressure to identify locations to fulfill the need for housing growth on the edge of the Borough's towns, particularly Belper and Ripley, as well as on the edge of Derby. The Council is also highlighting the challenges presented by CEG's proposals, such as addressing the impact of development on the local transport network; the protection of trees, other landscape features, and areas of importance for nature conservation, and that the development does not detract from the setting of the Grade II* Listed Building at Park Hall. There may also be a need to consider development on land beyond the area currently allocated for development in the Amber Valley Borough Local Plan. A six-week consultation period to allow people to view and comment on the proposals will take place from Friday 10 February to Friday 23 March. Councillor Stephen Hayes, the Borough Council's Cabinet Member for Developing Places To Live, said: "It's important, at this early stage, to get the views of as many people as possible about the prospect of a new local settlement at Denby. 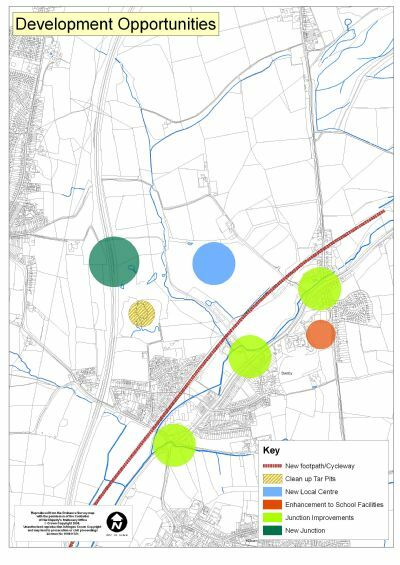 It is vital to stress that, at present, this is an option, which is part of our continued series of consultations regarding potential strategic locations currently being considered as part of the Core Strategy". I would strongly urge people who are interested in the future of this and surrounding areas to attend one of the public exhibitions being held later this month"
Further information will be available on the Borough Council's website from 10 February. 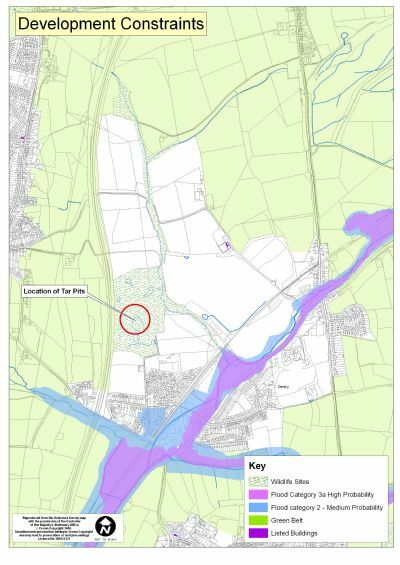 The proposed site is situated on land between east of the A38 and north of Denby Bottles. 3,000 houses with 2 adults and 2.5 children mmmmmmm arsenic should polish pretty much all of them off..........NOW I GET IT depopulation of Amber Valley! read on! On the last visit (January 2003) ALL OF THE 19 BOREHOLES both inside the fenced off area and in the surrounding fields, gave readings of PAH (a known carcinogen) that exceeded both MAC and DIV levels in the groundwater. Of particular concern is the fact that this report outlines that the specific PAHs to consider are Benzene and Napthalene entering the local watercourses. Any readings exceeding the Maximum Admissible Concentration (MAC) level requires intervention, as it indicates severe contamination in the local water table. Borehole AIGBH204 - for nickel, sulphate and zinc. Borehole AIGBH205 - for nickel, sulphate and selenium. Site wide results for arsenic and benzopyrene exceed the appropriate Soil Guideline Values, as published in the CLEA model (2002). 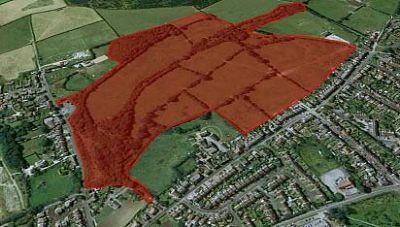 In February 2006, AIG carried out an assessment of 4.5 hectares of land to the north of DDP and the disused railway, falling within the Denby Colliery and Park Hall Opencast area of the proposed development. Initial engineering outline design recommendations for a proposed housing development were also included, based on the findings. The results of the testing have been compared with the DEFRA Contaminated Land Exposure Assessment (CLEA) UK Model in 2005. The means value tests indicate that arsenic EXCEEDS the appropriate Soil Guideline Values as published in the CLEA model.